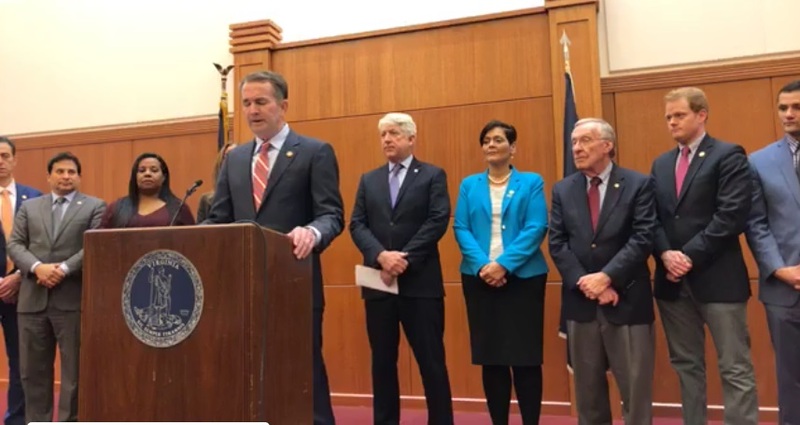 Governor Northam's Press Conference to "set the record straight"
Today, January 31, 2019, Virginia Governor Ralph Northam held a press conference, punctuated by hooting, hollering, laughing and clapping which sounded like an episode of the Fox show Married With Children, in which he accused Republicans of “playing politics” with regard to a bill which he favors permitting virtually unrestricted third trimester abortions. Virginia Attorney General Mark Herring, who appeared to have trouble finding out where he was supposed to stand, stated “desperation can be ugly and what we have seen from Republicans over the past few days has been desperate and it has been ugly.” No mention of innocent babies there. He also claimed that Republicans are responsible for death threats against members of the General Assembly. As near as I can make out from her garbled statement, Minority Leader Delegate Eileen Filler-Corn (D-41st District) accused Republicans of engaging in “in an all out assault on the reproductive freedom of women in Virginia.” She also labeled objections of Virginia Delegates to unrestricted third trimester abortions as “theatrics” and stated Republicans, by objecting to an abortion of a nine month old baby, are “shaming, bullying and dictating to women.” She later helpfully assured us that Virginia women will continue to run for political office in Virginia. I am sure Virginia Delegate Brenda Pogge (R-96th District) and Virginia State Senator Amanda Freeman Chase (R-11th District) were comforted to hear that statement as perhaps there were unaware that objecting to aborting a baby in the ninth month was somehow going to prohibit women from running for office in Virginia. Noticeably absent from this press conference was any specific reference to the legislation in question. After the national uproar, Tran understandably has been backtracking. Her present ploy is to say she misspoke and that killing a baby in the process of being born would be infanticide, a startling admission to be sure. Meanwhile, State Senator Jennifer Barton Boysko (D-33) has been busy trying to cover her tracks as the Senate sponsor of this bill claiming the prospective legislation only called for one doctor’s certification rather than two to approve a third trimester abortion and there was no other change in the law regarding the bill she sponsored. Tran mysteriously admitted in this hearing that no abortions would be conducted after the third trimester under her bill. “I don’t think we have a limit in the bill” she said. Tran’s bill also would have allowed third trimester abortions to be performed in a clinic instead of a hospital. The response by Tran was typical. She seeks to turn herself into the victim claiming she is getting death threats, although she declined to specify the nature of these threats. It’s possible her claim is true and if so it is reprehensible. However, the claim that she is getting death threats doesn’t excuse her execrable proposed legislation. In conclusion, Governor Northam said he was going to set the record straight. He did no such thing unless by setting the record straight he meant insulting Virginia citizens who care about unrestricted access to third trimester abortions.